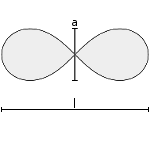 Calculations with the lemniscate of Bernoulli. Lemniscates are figure-eight shaped or shaped like the infinity-symbol ∞. 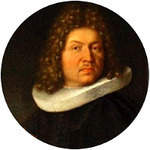 The lemniscate of Bernoulli is defined by the formula (x²+y²)²-2a²(x²-y²)=0. The two parts of the shape here are named drops. The surface area of one drop with height a is similar to that of a square with edge length a. Height, length and perimeter have the same unit (e.g. meter), the area has this unit squared (e.g. square meter).